For her birthday one year, I came up with a brilliant plan to pay off my sister’s housing loan. All it took was a lot of love, and a gift of a common house cockroach. It was 2003. Animal Crossing released the year prior in North America for the GameCube, and I would spend afternoons sneaking on to her save file, getting into her shoes, and setting off to work fishing and bug catching. I spent days paying off her housing loan this way—reselling the local flora and fauna, then depositing money to the Home Loan Shark Nook the Crook. Thinking on it now, I was also taking away her fun and character building. I honestly believed, in that moment, that I had a stroke of genius. Over the years, I’ve made many more memories with the Animal Crossing series—the life simulator in which you (a human) move into a town filled with anthropomorphic animals with distinct personalities, and start living independently with all the responsibilities of adulthood. The games are incredibly deep and fun, despite having the strange premise that may indicate otherwise. The series got its start in Japan 15 years ago but why are the games so endearing? No, thank you, Animal Crossing. I often have a hard time explaining and pinpointing exactly why, whenever I think about an answer to that. The truth is that there are several reasons on what makes them great. Here are just some of the things about the series which have intrigued me for all these years. The internal clock is one of Animal Crossing’s features that blew my mind when I was younger. Truthfully, it still does. In 2002, there was a satisfying feeling of being entrusted to make life decisions, and using those privileges to stay up way too late to go ghost hunting in the wee hours of the morning. In my quest to experience all the game offered—honestly, and without changing the GameCube’s clock settings—I picked up a hot tip from one of my animal neighbours. Seems there was an otherworldly spirit roaming the village at nights past midnight. Was this ghost full of regrets? What kept her/him here? What sort of animal was it? Was it a grizzly murder!? One sleepless night, I got some closure. It was past 2 a.m. when I discovered a glob of ectoplasm (that looked ever so slightly like a friendly Mario Boo), obscured in a forest of fruit trees I had not thinned out. As with all animals, he pleaded for a favour. Animal Crossing’s community building partially entails your character running errands at the insistence of your neighbours. Of course this ghost would ask same, and his request sent you on a quest to find spirit fragments before dawn. At the end of it all, he asked if you wanted a reward. The rewards were a game of chance which netted a pitiful, worthless exchange for the work done—again, an unsurprising turn of events given the terrible behaviour of the citizens of your village. Paint your roof with no colour input decisions by you, get an item (chances are you already had whatever stupid flooring or item he pulled out of thin air), or weed your town. What? That’s it? The fun of it all, regardless of the often cheapskate rewards, was in the exploration. That at any given moment—whenever a new hour lined up on the clock—the game could usher in a new, unexpected experience. Time and seasonal changes dictate the type of bugs and fish you can catch, and when they make their appearances (much like real life!). Night owl and early morning loving neighbours mean conversations could carry on at all hours, and those interactions allow players to familiarize themselves with personality types. Holidays and special events happen throughout the year, too. Celebrating these occasions in-game, and in real time doubles the enjoyment of any given festival, as silly as that may seem. It’s a tailored-made experience that imitates the real world, with all the joyous spiritual parts attached. Trick or Treating at Halloween no matter your age, collecting candy and risking being tricked. Present Day aka Christmas. Enjoying the longer days of sunlight signaled by the Summer Solstice. Bundling up and preparing for the Winter Solstice. Animal Crossing is pure in its intentions to replicate an ideal childhood and perfect world, in those regards. Nothing’s as clear as this as when these festivals pop up. The excitement surrounding them as seen by the animals’ attitudes towards them is infectious. Not to mention the mini-games or specialty items your characters gets as bonuses which celebrates your inclusion into its virtual community. Who doesn’t like receiving birthday presents in the mail, and parties thrown by your closest friends to show how much you’re appreciated? The landscapes change as the four seasons work their elements to alter appearances. The snowfalls of winter can lead to snowman building, with temporary friendships forming as magical snow people come to life. Swimming in Summer seems a given, while taking a dip in frigid waters in New Leaf will have your character sneezing. Trees are full of life in Spring which is a welcome sight after the snow-covered leaves of the months prior. And in Autumn, I always feel excited when the leaves and the grass develop an orange hue. It’s my favourite time of year in real life, knowing all the activities that await in the Fall. Animal Crossing captures that feeling for me too. Animal Crossing teaches the importance of relationships on a very basic level, without getting too involved in the overly complicated natures of human. Life lessons are abundant in the series, and maintaining those friendships means a certain loyalty on an animal’s part to your character. Getting to know them means fondness grows for them on your part too. But as with real life, relationships change and people can move on. That’s when Animal Crossing can hit you where it hurts. In the GameCube days, my sister and I became very attached to a blue jock of a bird named Ace. We haven’t seen Ace in well over 12 years, and we probably never will again. For a game that teaches the value of friendship, it also repeatedly highlights a particular process whenever a new game in the series comes out—Animal Crossing teaches abandonment. As anyone familiar with the series know, there are certain personality types and animals you may love more than others. The ability to formulate these characters with their sweet or frustrating personality quirks is where Animal Crossing is at its strongest. Incidentally, this was the only real thing that kept me playing the mostly awful board game, amiibo Festival. Nintendo knows how to write amazing dialogue to realize these annoying, friendly or slightly mean-spirited animals who charm with their own special brand of neediness, bluntness and adorableness. Ace was that beloved animal for us in the original. In New Leaf, Colton the golden haired hipster horse is my new favourite. Pietro the Demon Clown Ram is an animal I adore for being so bizarre. Henry the sweet frog and Mint the sassy, flippant squirrel with attitude for days are two of my sister’s favourites. There comes a time, no matter how strong you can build those relationships with them by talking to them daily or giving them presents, they’ll decide they need a new adventure in another town. They’re really rather ungrateful, honestly. If you’re not careful, they’ll abandon your friendship and move on. Begging them to stay usually works but it’s not long before they’ll muse about leaving again. It’d be cruel to not let them follow their dreams for your own selfish needs, which is why the next logical step is to turn off your game and never play again. Abandon before you are abandoned. The risk and heartache involved isn’t good for mental health. I know, it’s just a game. A really sly game that sucker punches your emotions. Half the fun of the series is in personalizing your experience to match your real life preferences and desires, if you so choose. In the most recent main game, New Leaf, customizing the town was a huge deal, and the options and ordinances your character could instate as mayor made the game even more in-depth. Town landmarks and building could be built at the request of animals and styled to your whimsy. It’s part of the reason why the potential of the design focused follow-up Happy Home Designer was so exciting—the options to expand the interior design of public buildings is something that will hopefully be implemented into upcoming games, for even more interactions with animals. Starting on the individual level though, there’s a light character creation for cartoon-y features of triangular shaped noses and eyes, or big eyes with luscious lashes and more; to a now extensive range of tame to outrageous hair styles. What comes later are the options to collect furniture from hundreds of sets that suit your needs, and the same can be said of clothing choices down to accessories and shoes. You can be a fashionista with an eye for interior design—for whatever your definition of those things entails. Rocket ships and a moon model can greet your neighbours when they visit. Same as a shanty home for a more earthy choice in simple living. In my case, as I’ve mentioned before, I’m fond of capturing a lone whale shark and tucking it away in my back room to hide my questionable animal cruelty. When I did it in New Leaf, I was trying to save it from a life of Re-Tail hell. I didn’t know what was to become of that shark had I sold him at the shop, and so I kept him in my room to live out his days in a tiny tank. Why didn’t I just set him free in the ocean? It’s much too late for that now. Let’s not speak of this again. I’ve always found it a little strange when your neighbours insist on keeping wildlife as pets but who am I to judge? 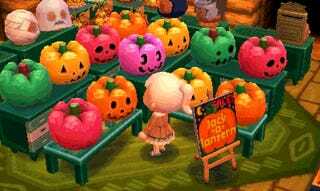 Animal Crossing’s teeming with life...that you can hunt and display in your homes as trophies or for decorative purposes, or donate to the local museum. These are real world fish and bugs, and fossils of dinosaurs which you can dig up, that come together from the world over conveniently in your town, and are curated at the museum. It’s pretty cool to make these discoveries, and is a non-intrusive way Nintendo sneaks in some higher learning. But it’s not just species knowledge the games pride themselves on. They also manage to incorporate history from a cultural perspective as well, in the form of famous fine art. Paintings and statues that are world renowned have a place in your town’s museum as well. But that’s where Animal Crossing gets even more interesting by playing a little game to test just how knowledgeable you really are. A bargaining con artist fox named Redd displays art for sale—usually 3 fake and 1 real—and it’s up to you to spot the real deal. Some pieces are obviously ridiculous while others take a keener eye, and worldly experience to recognize true art (Updated art section. Thanks to nonopanda for sharing a really cool story on this). Filling the museums also speaks to the completionist gamer in me. I never think about finishing my games to platinum status, but there’s something about Animal Crossing that wills me to collect all of these things. The challenge of chasing down a banded dragonfly, or getting bitten by a tarantula haunts me. Standing on the shoreline during thunderstorms to catch a rare fish just makes sense to do. There’s no real pressing time management in Animal Crossing, but financial management can lead to lavish lifestyles. The games have you doing crazy things as a daily routine if that’s your thing. There’s money in tree shaking (and dangerous bees, too). Money bags and gems hidden in rocks that can add to savings. Planting various foreign fruit trees for maximum fruit profit can make you a borderline fruit hog—all in the name of buying all the higher end furniture and clothes you can imagine, or getting house expansions to showcase your wealth. Though, for as hard as you work, it rarely feels like terribly mundane tasks. Animal Crossing lets you set your own pace and achievements, and achieve is what you’ll really want to do. Goals don’t seem so far to be attainable, and the lure of more space and more items helps drive interest. Every hour brings not only a new adventure to discover, but a new tune by which to do so. Animal Crossing’s soundtrack is weird, catchy, easy-going, pensive, charming, and suspenseful—all the ingredients that make for an interesting life. The songs change to fit the mood of the time of day: to breaking in early morning activities to taking long luncheons to welcoming the quiet of the setting sun. There’s that odd meowing at 1 p.m. in the original game, which I will never tire of. There’s so much that makes the series great... some things I’m sure I’ve missed talking about. Bonding with neighbours is one of the series’ signature aspects. 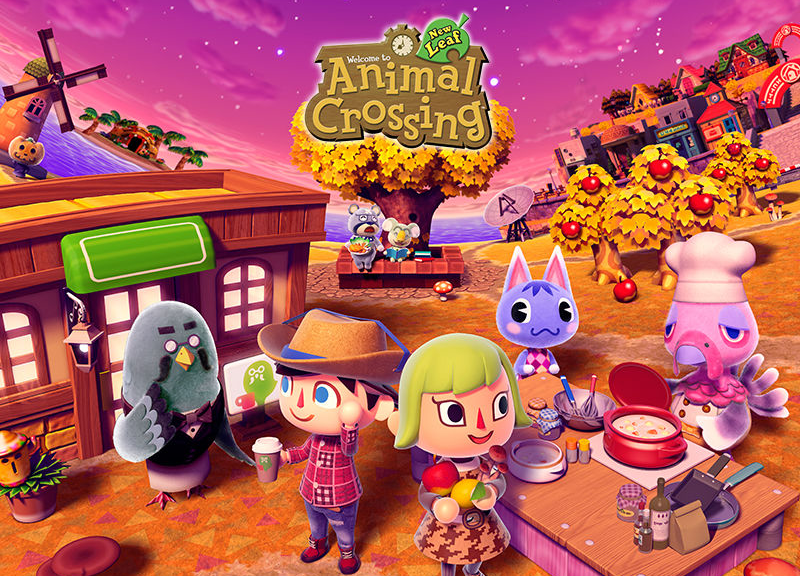 New Leaf may have given multiplayer games which connected players online in a whole new way, as well as expanding public works projects to interact with the town on a more personal level—but Animal Crossing’s always been about having a communal space in which my family could all play in. I’ve always played the series with my sister, and like the best Birthday present cockroach a girl could give, we’ve spent many years together with almost every entry enjoying each others’ company. Our characters are always the same: She plays as a boy and I play a girl, with particular features and specific names, so that we can carry out a tradition we began back in 2002. It’s the one thing we’ve shared and continue to do so. This may be a personal reason, but those memories these nearly 15 years are what have been most special about the series for me. Wherever the series goes next, it’ll bring us something new that we’ll become fond of, too. I’m certain of it. Got any Animal Crossing memories, or thoughts on the series to share too? Let’s hear them!